Inexpensive brake set from Weinmann. See Incorrect Information? Log-in to submit report. VeloBase.com relies on its community of vintage cycling enthusisasts to add much of the information on the site. However no one is perfect, and there will be some mistakes in the information. If you spot incorrect information, if you have permissions to do so, please edit the item yourself. Otherwise, please note it below so that it can be updated by the Administrator as quickly as possible. 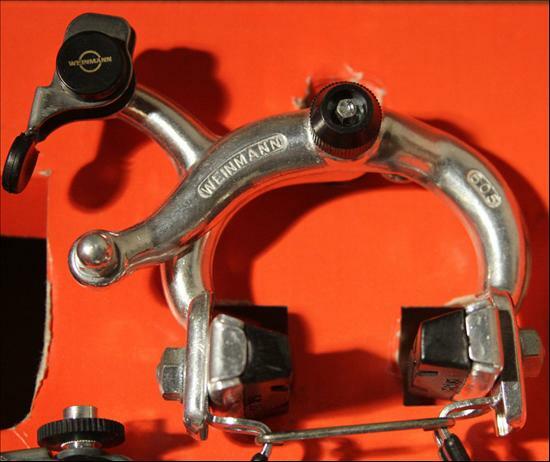 Founded in 1933 in the swiss Schaffhausen by Otto Weinmann, very close the border to Germany, over the years Weinmann became a very well reputated and one of the world leading lightweight bicyle parts builder, focused on brakes and later rims (in the 1960s the Weinmann colle rims became very famous). In the 1960s Weinmann delivered DiaCompe with brake parts and in the 1970's and 1980's this cooperation lasted in the production of Weinmann's top modell Carrera. At the date of the 40th company anniversary they had more than 700 employees and two affiliated companies in Singen, Germany (Weinmann & Co. KG) and Schoten, Belgium. After the swiss location has been closed in 1991 business activities were administrated from the German subsidiary in Singen. Sources: -Advisory information by Marlise Wunderli from Schaffhausen's town archive. -Advertising in the issues from 1952 of the german magazine "Radsport"
By pressing Verify below, you express verification that the photos shown are indeed of the component listed. Please do not verify if you are not sure that all photos are of the correct item. If you identify a photo that is NOT of the correct item, please use the Report feature to flag that photo. Note: You can not verify photos that you have uploaded.